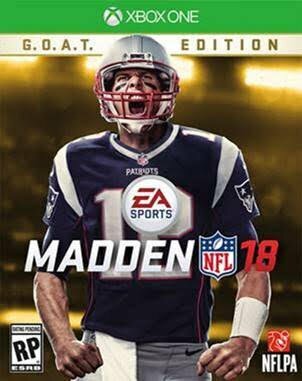 Today Electronic Arts Inc. (NASDAQ: EA) revealed New England Patriots quarterback and five-time Super Bowl Champion Tom Brady will grace the cover of EA SPORTS Madden NFL 18when it launches worldwide on Friday, August 25. This year’s game will be powered by Frostbite, one of the industry’s world-class game engines, creating a Madden NFL experience like you’ve never seen before. Frostbite delivers a significant visual leap not only to the players, but crowds, stadiums and more. Such a special game truly deserves an equally-special cover athlete. In addition to the cover news, EA also announced pre-order offers for two distinct editions of Madden NFL 18. Fans who pre-order the standard edition will receive numerous benefits*, including the choice of an Elite player from their favorite NFL team for use in Madden NFL 18 Ultimate Team, as well as five Squad Packs, redeemable at launch. In celebration of the Greatest of All-Time, those looking for even more can opt for the G.O.A.T. Edition, which gets them not only what’s in the standard edition, but also one of five G.O.A.T. players of their choice for Madden NFL 18Ultimate Team, and more.